Ever wondered what relief looks like? 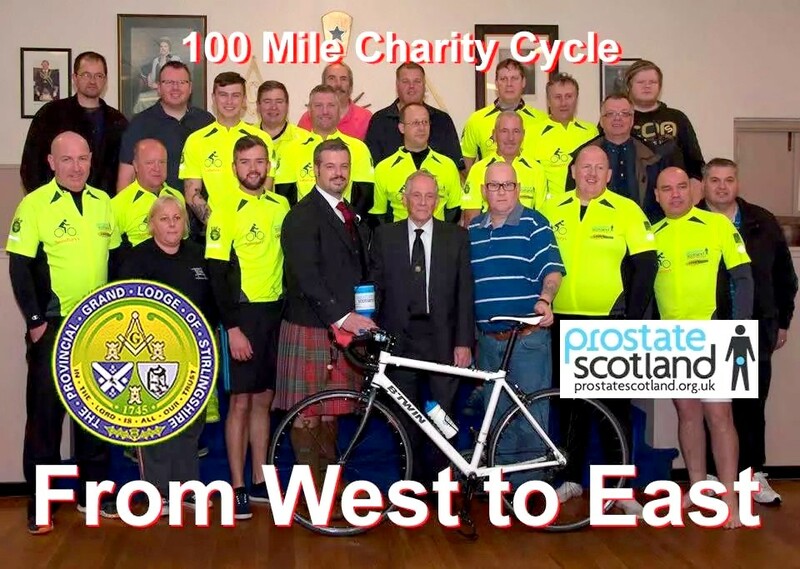 Just view the smiles on the faces of those Masons pictured below who cycled around 100 miles during Saturday and Sunday 18th and 19th October 2014 while visiting all 23 Lodges in the Province of Stirlingshire to raise money for Prostate Scotland. It was a fantastic effort by all involved including the support team. The various Lodges were most generous in their receptions and made substantial donations along the way. Saturday had some sunshine but Sunday took a real effort by the cyclists in torrential rain and driving winds. The adrenalin was however pumping through their weary legs and they all made it. Bro Kevin McLean, RWM of Lodge St Andrew (Denny & Loanhead) No 176 welcomed the cyclists at the end of their gruelling journey by piping them into the Lodge where hot soup and sandwiches were gratefully accepted. Thousands of pounds have been raised through peddle power for a really worthy cause. The Provincial Grand Master Bro Andrew A McKinnon was at Lodge Loch Lomond No 1483 to cheer the cyclists on their way on Saturday and visited several Lodges along the way including the start point on Sunday, namely, Lodge Clackmannan No 1303. He was there to meet them again at the end of a long, weary and very wet road in Denny. Pictured immediately below is the RWPGM along with Bro McLean and most of the cyclists who took part. The final amount and more pictures will be published as soon as all fundraising activities have ceased. The final event will be a Prize Bingo to be held in Lodge St. Andrew (Denny and Loanhead) No 176 at 7.30 pm on Thursday 20th November 2014. All are welcome to attend. Click the camera for more pictures taken by Bro David Farquhar (793).